Ebba-Viva Fairisles (awesome character name) is a slightly immature young-woman with six over-protective fathers. Her youthful nature is partly the fault of her six fathers, and partly her own resistance to accepting becoming an adult. Each of her fathers has a unique personality; however, with six of them it can be a struggle to remember each of them individually. We don’t discover Ebba’s birth origins in this book, but it’s very clear that it isn’t important to her. Pirate adventures with all of her fathers is all that matters to Ebba. The pirate speak is not difficult to understand. It is the parts of the pirate ship and keeping it sailing that can be a little daunting. If you’ve seen any pirate movies it will help your mind’s eye when navigating Felicity. Ebba was raised on the ship and finds it more difficult to interact with people on dry land. It is on land when she makes a dangerous mistake that almost costs her, her life. Who is Ebba-Viva’s love interest? There are two handsome fellows who cross paths with Ebba in this book. Both males are intrigued by Ebba. I’d go as far as to say they’re fascinated. In any case, the love story of Immortal Plunder is definitely a slow-build. 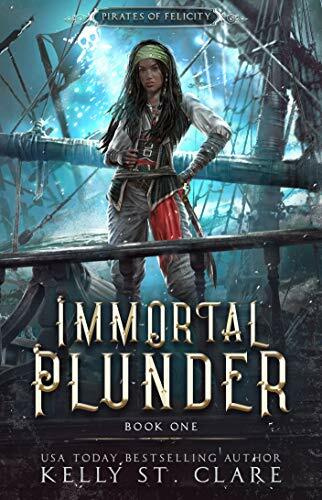 Immortal Plunder is definitely more focused on the pirate adventure to thwart Captain Pockmark and his crew on the ship Malice. It is because of Ebba’s trouble with Pockmark and his crew that her and her fathers are thrown into a dangerous treasure hunt. The crew of Felicity and it’s part-time guests spend a lot of time at sea. While it’s not her fathers’ first treasure hunt as she’d later learn, it is the first time they’ve encountered magical beings. No one wants to believe in the magical tales they’ve been told aboard Felicity; however, the dangers they encounter can’t be explained otherwise. Also un-explainable is Ebba-Viva’s role in the magic they encounter. In each instance that they encounter a place affected by magic it is mentioned that it hasn’t been magical before. No one had seen or truly heard a siren before. No one had encountered the magical creature with snakes around his neck. Is it possible this is somehow linked to Ebba-Viva? Overall, this is an enjoyable pirate adventure. The story progresses a little slowly, but it is nice to see a female pirate regarded as strong, even if she needs to learn a little independence. That is possibly to come for her, along with a little romance, by the end of book two.